Changing order status in bulk modification allows you to change the statuses of several orders at once in your CS-Cart admin panel. allows changing the statuses of several orders at once. 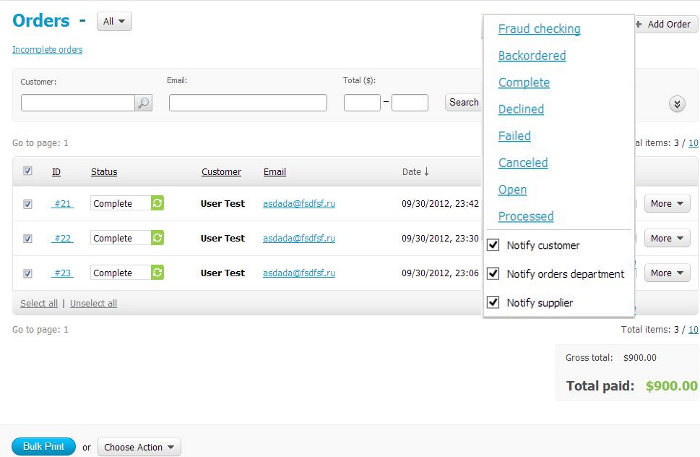 On the Orders editing page to the left of the Add order button a drop-down button Change Order Statuses appears where you can choose the order status and specify notification settings. Tick the necessary orders, the status of which you would like to change, and then click on the drop-down button Change Order Statuses to choose their status in bulk. The status of all chosen orders will be changed. Initial price of this modification for CS-Cart v.3 was $120. Now we are ready to implement it for $80. Please, contact us, if you have any questions about this modification.